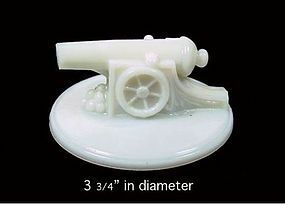 Cannon ~ Candy or Powder Jar Lid Only- HTF! This white milk glass candy, or powder jar lid was made during the depression era by a company unknown to us. The base has drum decorations on it suggesting the Civil War, but we only have the lid. There is a small sliver off of the right hand side of the barrel. This delphite blue, or chalaine blue powder jar is hand painted with a floral decoration and is in excellent condition. It has a triangular shaped knob on it and still has the powder puff inside. We are unsure of the maker but estimate it to be from the late 1920’s, or early 1930’s, and was probably made by either McKee Glass, or Jeannette Glass Co. 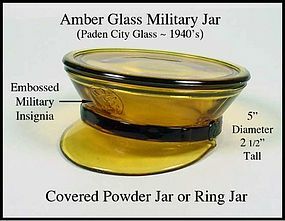 It is a true powder jar and has a round compartment in it and no other compartments offset inside like some other ones we have seen.